Damore wrote in his infamous Google memo that women are not suited for tech. Women in tech have a lot to say in reply. Upon reading James Damore’s Google Memo, I was inspired to respond to his words by pairing my personal experience with facts defying his stance. The following is my retort to his divisive words. I grew up in a very patriarchal society, and had gotten used to hearing that boys and girls were different. Despite that, my mother was the entrepreneur in the family and was always the one who drove our household earnings. She was the rock of the house, tenacious and extremely smart. There were a lot of struggles that our immigrant family went through, and she pulled us out of every one of them. And yet, from her own mouth I would hear how boys can do this, and girls can’t do that. She was a walking contradiction. The societal message that was so deeply ingrained in her psyche made her impart these false distinctions onto her own daughter. This dichotomy is what led me on my journey to understand and ultimately shrug off the message. It was a big shrug, but it could only be done as a shrug because as a minority woman, I was not allowed to rage or be aggressive. That shrug was the only way to succeed in a tech career as a woman. Instead, I had to silently toil, often working 80 hours a week during my earlier days at Palm. I would toil away even after all the lights in the office had been turned off, because I had to prove to everyone that I deserved to be there. James, how often have you been the last one in your large office? Over the years, I would pull all-nighters while shrugging off advances, unwanted kisses, hugs and lap dances, sometimes bought for me by my boss as he watched. Shrug. I didn’t complain the next day, but yucked it up with my boss and went to our client meetings. James, have you ever been mortified by your boss and had to pretend to enjoy it? You said women don’t take stressful jobs because we’re not biologically inclined, but do you think you can handle the stress of working in these conditions? Women have to deal with an entirely different level of stress. The fact is that women are physiologically better at coping with stress. In light of all the stories coming out of Silicon Valley, I realize my story not only isn't unique, it's the norm that women in tech have become so very used to. That is why when I read your memo I found it so personally hurtful and enraging. Your memo perpetuates the myth that women always play the victim, when so many of us could never afford the luxury of complaining. Keeping silent was the unwritten rule to succeed in a male-dominated industry. “In reply to your recent communication, I would state that we have not now, have never had, and do not expect to have in the near future, any women students registered in our engineering department,” wrote a professor at University of North Carolina. 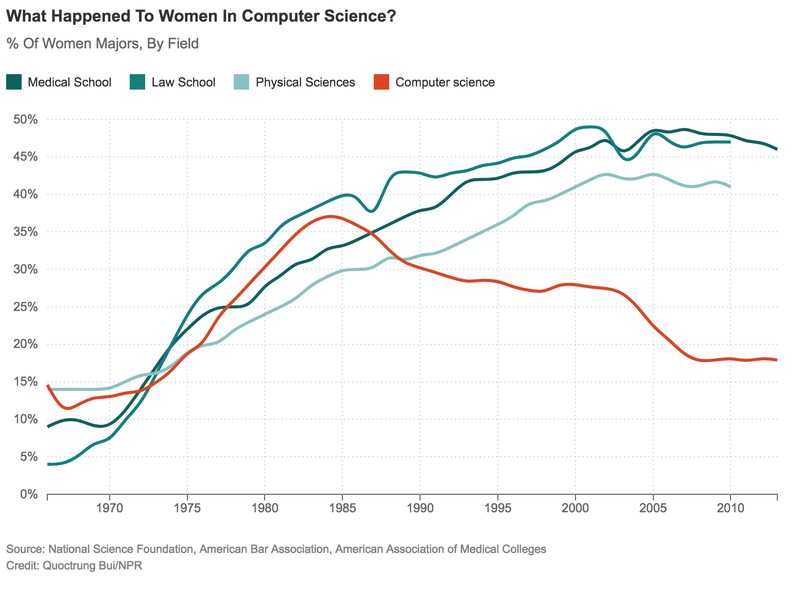 Despite all these societal and historical biases, women in engineering grew from the 1960s to the 1980s, so let’s drop this fallacy that women are biologically different and thus not interested in engineering. Biology has nothing to do with it as shown in the chart below. The fact is, another blow came in the form of more gender bias in the 1980s when personal computers (PCs) came to market and were exclusively marketed towards rich white boys, leaving girls and disadvantaged minorities behind (as discussed by Steve Henn on NPR). PCs were pitched it to parents as toys for boys. As a result, PCs were locked in boys’ rooms, away from their sisters. My dear mom, so full of contradictions, bought a PC for my brother but thankfully saw the sense of making the PC an accessible device to me as well, by setting it up on our rarely-used dining room table. Incidentally, I (not my brother) spent the most time on the damn thing, playing Tetris and learning command lines. So, James, women don’t avoid engineering because we’re too biologically different. Many aren’t interested because we’ve been discouraged from our interest at every turn. Imagine that despite all this -- your parents discouraging you, your school discouraging you, your friends discouraging you -- you still end up in tech, where your co-workers and boss treat you differently. Despite all this, James, you still excel. You go on to start your own company, which generates eight figures in revenue with no VC funding, and is declared one of the “fastest growing” in its field. You’ll find that your “shrug it off” method and perseverance has made you a success, so you decide to start another company. This time you decide to raise VC funds, but once again you’re up against biases that are so deeply ingrained that only 2 percent of women receive funding. Did you ever study sexual linguistics? I did, and I’m very aware how language impacts perceptions. Harvard Business Review did an amazing study for over a year, where they recorded venture capitalists’ discussions to understand the impact of words. In the early days of fundraising for my current venture, IOTAS, I heard “no” from over 60 VCs. I reflect what it’s like to raise venture funding as a woman and things are getting worse. For example, “In 2016, 5,839 male-founded companies got VC funding, compared to just 359 female-founded companies. 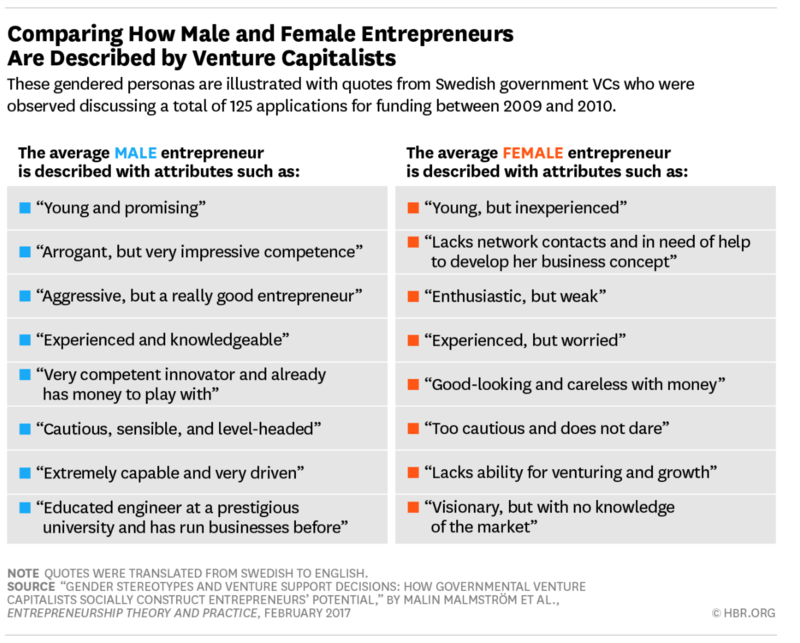 In other words, companies run by men got more than 16 times more funding than companies run by women” - from Fortune’s “Venture Capital’s Funding Gender Gap Is Actually Getting Worse”. Being scrappy, I managed to go through the grueling, but less biased, process of grant funding from the National Science Foundation and National Institute of Standards & Technology. Most recently, IOTAS raised a series seed round with Oregon Angel Fund, Rogue Ventures and others totaling $2.25M. Even during this successful round, I was disturbed when a VC firm that primarily invests in minorities and women passed on our series seed round, because the valuation agreed to by our lead investor was considered too high. Too high!?! Do women and minority focused VCs immediately expect that the valuation of the companies that they want to support will be cheaper? It’s hard enough to get funding as a minority woman, but when the VCs who support you discount your value, then it’s not just hard -- it’s nearly impossible. Regardless, we closed the round with excellent investors who valued our company and team and gave us the valuation we wanted. James, as to your scientific theories, is it possible that we’re both right that? There are biological differences between men and women, but there are even stronger social constructs that need to be challenged and thrown away. As you said yourself, “Many of these differences are small and there’s significant overlap between men and women, so you can’t say anything about an individual given these population level distributions.” The differences, as science points out, are so small that it should make no statistical difference as to why women aren’t in engineering. So, based on your own argument, it must be rooted in some other issues; possibly at historical and societal biases that led to women not being in engineering. Shouldn’t humans strive to be more, to be better, than our base biology dictates? Do you want to be no more than an ape? As you see it, “Status is the primary metric that men are judged on” i.e. the need to be superior to other men is also seen in the base needs of our cousins, the apes. Is that where we want humanity to be -- our base self? Isn’t Google trying to achieve something better? Isn’t Google striving for something more than what our biology, society and history hands us at birth? I have a little 8-year-old girl who, perhaps because no one told her she wasn’t supposed to, loves to code and loves her robotics class. Sadly, she is only one of two girls in her robotics class because parents still wrongly assume their girls won’t be interested in these things. But, how is an 8-year-old to know what interests them unless they try? That is why these programs to teach girls to code are important, so they can try. I see myself in both her and my little boy’s eyes. Like my mother, I am the sole bread-winner (and my husband also breaks gender expectations and is a proud, loving and wonderful stay-at-home dad.) Unlike my mother, I will not tell her what she shouldn’t be interested in, so she can strive to be more in every way. Sexism in Tech Is Dying: Are You Still Part of the Problem?